Sri Lanka can move forward in reconciliation if peace-loving Sinhalese and Tamil politicians work together, argue, and criticise without making racial remarks to hurt any ethnic group, Singapore Indian Chamber of Commerce and Industry Chairman Dr. R. Theyvendran said. “Start open dialogues, and find a middle ground that is beneficial for all Sri Lankans, learn from past mistakes, and rise above petty disputes for the benefit of all,” he said. 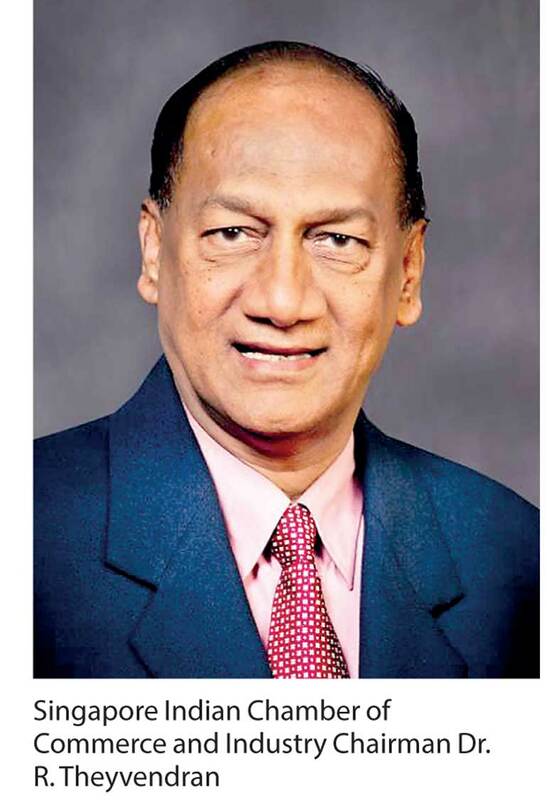 A well-respected Ceylonese-Singaporean Tamil, Dr. Theyvendran said that Sri Lankan politicians must believe with every fibre of their being that ‘together we are stronger’, and eradicate all the years of hatred. He also stressed that charges of bribery and corruption are not good for the image of the country. Q: Can you explain Singapore’s stance on maintaining ethnic and religious harmony? A: I believe that the religious and ethnic harmony that we enjoy here in Singapore has not happened by chance. Our founding fathers worked hard to lay the foundations for harmony, and this now transcended into mainstream culture. Our commitment to this harmony does not merely rest on law and institution alone. It stems from a belief in this one ideal – ‘Together we are stronger’. We celebrate festivities together. Regardless of their race, language, and religion, it is compulsory for the Singaporean teenagers, who are at the age of 17 and above to complete the national service together for a two-year stint in the Armed Forces, Police or Civil Defence. More importantly, our schools allow children from all walks of life to study, play, and grow up together. From a young age, students are taught the origins of Singapore’s major religions, and are encouraged to relate to people of different races and religions. This encourages them to share and maintain common space and to guard against prejudice and harmful stereotypes. Shedding ignorance or negating the fear of the unknown will ultimately dissipate misgivings and hate. While we may still have our racial slurs and jibes in everyday life, common place in society, but it generally and most certainly is not borne out of prejudice. Diversity can be both a strength or a weakness depending on how the collective view it. Q: What are your experiences of living in Singapore with all ethnic groups? A: All in all, I love living here and consider it a blessing. I have not been deprived of the chance to aspire, the chance to dream, and importantly, the chance to achieve. We do joke and jibe about peculiar habits of our ethnicities but I’m generally hard-pressed to find instances where I was singled out due to my colour, or for the way I pray, or vice-versa. I grew up with all the different ethnicities playing together in the fields as children. Moreover, I have never considered another ethnicity in any other fashion but Singaporean, regardless of colour or prayer, and I believe the same applies to the way others look at me. Q: How do you think Singapore can be a model for Sri Lanka’s reconciliation process? A: Sri Lankan leaders have to be reconciliatory. They must believe in their fibre that ‘together we are stronger’, and eradicate all the years of hatred. One of the best ways to rid yourself of hatred is to rid yourself of ignorance. Start open dialogues, and find middle ground that is beneficial for all Sri Lankans; learn from past mistakes, and rise above petty disputes for the benefit of all. Q: Singapore has a Harmony Day to get all ethnic groups together. How effective is this to reconciliation? A: It is not so much reconciliation, rather a time to celebrate each other’s cultures. Children are encouraged to dress up in the costumes of other ethnicities. When we wear other’s shoes we relate better to their points of view. We see as they see, and understand them better. Q: After a three-decade-long war, Sri Lanka is in the process of reconciliation. What are your comments about this as a member of the Sri Lankan Diaspora? A: War achieves little but to satiate ego, or to restore or consolidate power. Very few benefit. The ones that don’t generally lose much more than those that gain. It is about time Sri Lankans reconcile and progress. Q: What do you think we are lacking to make the reconciliation process effective? A: I do not think I am qualified to answer this as I have not lived in Sri Lanka for any considerable period of time. But, what I can say is that I like the country but not the politics. The charges of bribery and corruption are no good for the image of the country. I visited Sri Lanka couple of times and people are lovely despite ethnicity. I once travelled to Jaffna under curfew and it was to recruit some people for my company. I have seen life there. Sri Lanka is a beautiful country with good friends and sincere people. Q: How do you think Sri Lanka can move forward in reconciliation? A: I think first of all there should be peace among the politicians. All Sinhala and Tamil politicians should work together. They should find a way they can argue and criticise without making racial remarks to hurt any ethnic group. When they do this to get people’s sympathy, it stirs unrest among people belonging to different ethnic groups. Q: Is the Ceylon Sports Club in Singapore is open for Sinhalese and Tamils? A: Yes, they are co-existing and are good friends. They are rivals when they play cricket as they play the game in two groups but there are no fights between them. In the club they are together but get divided only when playing cricket. They help each other and live peacefully. In Singapore, they can’t fight as two different ethnic groups as the government has very tough laws on it. They can be arrested and put behind bars for disrupting harmony among ethnic groups. In Singapore, we enjoy freedom but there is no freedom for racial disharmony. Sri Lanka should also learn this as a lesson to implement the law to arrest those who create unrest among ethnic groups. Q: As a member of the Sri Lankan Diaspora, how do you think you can contribute to Sri Lanka in the post-conflict era? A: I believe in the saying, “give a man a fish and you save him for a day, but teach the man to fish, and you save him for life”. We were blessed that we had a very enlightened, progressive group of founding fathers that have successfully entrenched our integration into our culture. Therefore, the only way I feel I can contribute meaningfully is to share my experiences as a Singaporean, and hopefully give others the confidence to rise above petty hate, and move on for the benefit of the collective peoples living within their unique geographic location.